I like to try to make things from scratch when I’m cooking. It’s more delicious, less expensive and typically causes less landfill trash so it really appeals to me. Usually when I’m looking for a recipe I’ll do an internet search, read the reviews, pick a recipe and just go with it. If we like it the recipe stays in my rotation. But each and every recipe I’ve tried for cornbread has been lacking something. And usually a little on the dry side too. Then recently a dear friend brought homemade cornbread to us. It was tasty, lightly sweet and perfectly light textured. We loved it! I begged for the recipe and she shared it with me. (Thanks Virginia!) I made this cornbread with chopped jalapenos tonight to go with a hearty pot of ham and beans for supper. It also pairs nicely with my homemade Beef & Black Bean Chili. Absolutely delicious! Yes, I’ll share. First I pulled out and measured the ingredients: yellow cornmeal, flour, sugar,baking powder, salt, milk, egg, vegetable oil and some jalapenos. I love the wholesome ingredients in this recipe. Then I preheated the oven to 425 degrees and placed my cast iron skillet in the oven as it was preheating. I think placing the batter in hot cast iron gives the cornbread a nicer crust. While the oven (and the skillet) were preheating I mixed the dry ingredients in a small bowl. In another bowl I mixed the milk, egg and vegetable oil until blended. Then I combined the ingredients in both bowls, stirring until blended. I tossed in some chopped jalapenos and then stirred the batter until the ingredients were fully incorporated. I like my food spicy so I didn’t seed the peppers, but for a more docile palate the peppers can be seeded to reduce the heat somewhat. Now I pulled the hot skillet from the oven and greased the bottom of the skillet with unsalted butter. Again, this is to assure that buttery crisp crust that we love so much! Now I pour the batter into the hot skillet and place the skillet back in the oven to bake. About 20 minutes later the cornbread is beautifully brown. When I brought the skillet out of the oven I brushed unsalted butter across the surface – just my preference. Here’s the recipe – give it a try! Preheat oven to 425 degrees. Place cast-iron skillet in oven as it is preheating. Carefully remove hot skillet from oven and grease with butter. Pour batter into skillet and bake 20 to 23 minutes or until toothpick inserted in the center comes out clean. (Note: You can use an 8 inch cake pan that has been greased or sprayed instead of a cast iron skillet) Mexican-Flavored corn bread: Stir 1 cup whole kernel corn, 2 tablespoons chopped green chilies and 1/2 teaspoon chili powder and follow baking directions above. Remove from the oven and top it with 1/2 cup of shredded cheddar or Monterrey jack cheese if you would like. This entry was posted in Blog Posts and tagged Cooking, Environment, Frugality, Recipes on September 27, 2013 by Texas Homesteader. I love cooking in cast iron! Thanks for sharing on the What’s for Dinner link up! This looks delicious! You know something funny… (or not – haha), I’ve used cast iron pans for several years now and I have yet to bake with them! I’m pinning this recipe for future reference. I love all things Jalapeño and it’s been a long time since I’ve made cornbread! I love Jalapeno Corn Bread! Thanks for Sharing On My 2 favorite Things on Thursday, Hope to see you again this week!! Pinned! This looks great. I use my cast iron often, but I’ve never tried baking in them! That looks amazing! I’m going to have to try it for sure. I adore my cast iron skillets, but yours looks amazing (especially for its age, haha!). How do you season it? I use shortening after washing to season, but starting to think maybe there’s a better way to do it. I just can’t wait to try this! Sounds delicious. I love jalapenos! I was just telling my husband the other day that I wanted some chilli and cornbread. I think I’ll have to use this recipe! And that is a BEAUTIFUL cast iron pan 😉 Thank you for sharing at Merry Monday! I love cooking in cast iron and will be adding this recipe to my repertoire! You totally nailed this recipe!! I love cornbread and adding the jalapeños just rocked it!! And of course we just had to feature it this week at Freedom Fridays!!! Hugs and Happy New Year fellow Texan!! Looks like a great recipe! Thanks for sharing at TTF! Looks good, I also have wanted a good cornbread recipe, thanks for sharing, pinning to my everything yummy board. I just made cornbread in my cast iron skillet a week or so ago! None better in my book 🙂 Pinning your recipe as Mr. B likes his food spicy! I love ham and beans for dinner and we always have cornbread to go with it. I’ve never made it homemade, always going with good ol’ Jiffy mix. I’m pinning this recipe, so I can try it out soon! It is a great recipe, one that I’ve used for years having found in on the package of corn meal in my early days of cooking. Always cook it in cast iron and it never fails. Recently took a couple of batches premixed with us to Minnesota. Cool day, ham and beans with hot cornbread…doesn’t get much better. I love cornbread! Thanks for sharing the recipe, can’t wait to try it! I’ve still got jalapenos coming out like crazy in my garden so I’ve been trying to find new ways to use them up. Definitely will give this a try! Thanks for sharing at Share Your Stuff Tuesdays! As a fellow Texan and cornbread lover, I feel that it is my duty to make this recipe! Yum! Perfect for the season! 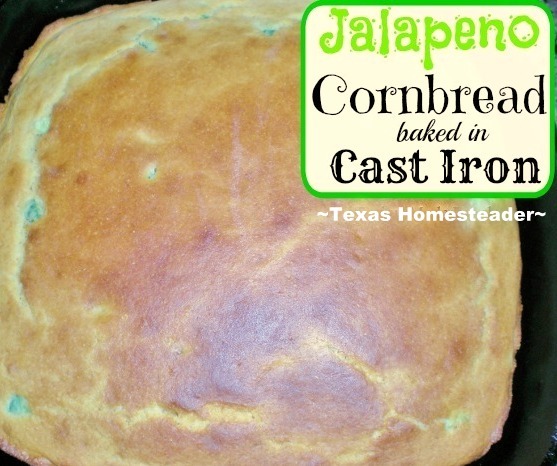 When it’s cold outside the jalapeno on this cornbread will heat you right up! Love it! Thank You for sharing Tammy, visit us again at the Fluster Buster party next week! Lizy your party co host. I love a good cast iron Recipe! And love southern cooking, we’ll have to give this one a Go! Thanks for sharing! Cornbread is one of my favorite things in life! I make this same recipe, but reduce the sugar to 2 T and use whole wheat flour. It is also better if you can find whole grain stone ground cornmeal. Looks like I need to buy me a cast iron skillet. I used to have one, don’t know what happened to it. Thanks for linking up with us at the Four Seasons Blog Hop. I am pinning this.